Many argue that the bad-boy spectacle known as Martin Shkreli, the former Turing Pharmaceuticals CEO, has deeply damaged drug companies’ reputations. I would counter that he’s been more of a godsend, a human shield for the industry’s routine, abhorrent activities. Take Thursday’s House Oversight Committee hearing on price gouging in drug sales. Shkreli’s decision to plead the fifth — and smirk his entire way through his limited presence at the hearing — dominated media coverage. So did his tweet afterwards: “Hard to accept that these imbeciles represent the people in our government.” And everyone got a laugh at the viral video of Shkreli rushing to an awaiting limo, only to realize it wasn’t his. Shkreli’s unique ability to inspire hatred absorbs so much attention that you probably know nothing else about the hearing. For those that missed it, the Oversight Committee shed light on the habitual practice of purchasing “orphaned” drugs without competition and increasing prices exorbitantly. We typically associate opportunistic strategies like this with hedge funds, but it’s also de rigueur in pharmaceuticals. And it’s made possible by government-enforced monopolies the industry enjoys, which allow it to game the system at the expense of patients and medical providers. We know by now that, under Shkreli, Turing acquired Daraprim, a life-saving medication that treats toxoplasmosis in roughly 3,000 HIV/AIDS patients, and then raised the price from $13.50 to $750 a pill. Documents released by Democrats on the Oversight Committee this week show Shkreli expressing glee at the ability to swoop in and earn well over the initial $55 million Daraprim investment. “$1bn here we come,” he told members of the Turing board. The only reason Daraprim attracted attention was that Turing got a bit too greedy. Earlier price hikes with cholesterol medications Chenodal and Thiola received no pushback. Shkreli understood that if you find obscure drugs without competitors — because no company could afford to step in to market an alternative to a tiny patient population — you can make billions. Committee chair Jason Chaffetz (R-UT) emphasized this by publicizing Turing executive salaries that rose $250,000 in a single year, and yacht parties that featured fireworks and a cigar roller, even as the company claimed to have earned no money. Many other drug companies have made similar calculations. Valeant Pharmaceuticals jacked up the price of heart medications Isuprel (525 percent) and Nitropress (212 percent), among others. At the hearing, Howard Schiller, Valeant’s interim CEO, had the temerity to argue that these increases were fine because hospitals paid for them instead of patients. But that strains the overall system and makes it harder for providers to meet primary care objectives. Valeant and other drugmakers benefit from America’s unique market pricing system, which lacks a unified government negotiator. But the market is in no way free. Drug companies enjoy patent protection on their medications for 20 years from the date of filing, and can tweak the formula slightly to reset the clock, or “pay for delay” to generic manufacturers to get them to stop making alternatives. They can also purchase drugs on the open market, identifying profit-making opportunities with the security that nobody can limit what they charge. Companies can also acquire exclusive marketing rights for a drug for anywhere from six months to seven years. That market distortion leads to all sorts of absurd strategies. Valeant has been accused of using specialty mail-order pharmacy Philidor, which they secretly owned, to push Valeant drugs on patients. Other mail-order pharmacies are run by “pharmacy benefit managers” — middlemen between drugmakers and insurance agencies who have a conflict of interest to peddle particular products. Many drug companies use “assistance programs” to lower co-pays for patients, shifting the costs to insurance companies. Memos from Valeant and Turing show that the assistance programs were a pure public relations maneuver to induce the use of unnecessarily high-priced drugs by hiding the costs. Ultimately, everyone pays higher insurance premiums as a result. Hurdles to generic competition and intricate profit-making schemes have led to shortages all over the country and rationing of treatments, which is not only a public health nightmare but has the added benefit for the industry of raising prices in response to limited supply. 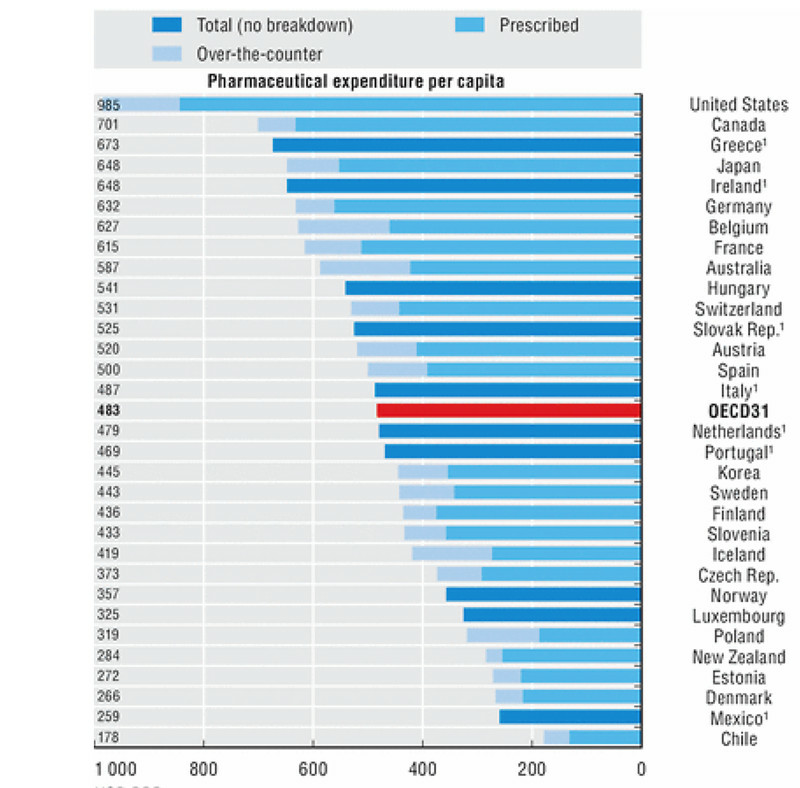 This is why Americans pay more for drugs than patients in any other developed country. This is why people must choose between eating and buying their medicines, as many Congressmembers noted yesterday. You can argue that the lure of high prices encourages innovation, but there’s nothing innovative about picking up a drug in the marketplace and arbitraging the system for a windfall, or any of the other ways drugmakers get some other participant in the system to hand over outrageous sums of cash. The industry claims it must target prices so high to recoup the heavy costs of research and development. But the hearing showed that companies like Turing and Valeant don’t spend much on R&D at all. Congresswoman Brenda Lawrence (D-MI) points out that Valeant’s R&D equaled only 3 percent of sales between 2014 and 2015. Turing had a similarly low percentage, until a public relations consultant told them to raise it. To this day, Turing has not brought a single drug from the conceptual stage all the way to market; its profits come solely from drugs it purchases and makes available at a premium. But Republicans on the committee mostly used the opportunity to bash the Food and Drug Administration (FDA) for taking so long to approve generics. If government would just let the marketplace correct the error, there would be no problem. “Every extra day gives companies more time to screw the consumer,” said Rep. Blake Farenthold (R-TX). There is a backlog of generics at the FDA (though officials at the hearing said that it has been whittled down). Of course, we have the approval processes so that drugs put on the market don’t poison people, so I don’t see how there wouldn’t be a trade-off from rushing things. Farenthold compared analyzing a drug to swiping air travelers with a metal detector; it’s a bit more complicated than that. There are solutions beyond the market-based approach. You could limit the patent monopoly that gives drugmakers market dominance. You could have a single government-based negotiator for prices, like the “all-payer” system former presidential candidate Martin O’Malley instituted in Maryland. You could use alternatives like having the government finance research and development (which it already does to a great extent), or a prize system that rewards effective treatments through buying the patents, paving the way for generic medications more quickly. Instead of identifying these options, we’re busy hating on Martin Shkreli. He’s really just a symptom of a drug industry in America that by design allows a business model based on gouging consumers. Instead of browbeating the inevitable beneficiaries of that system, we have the power to simply fix it.